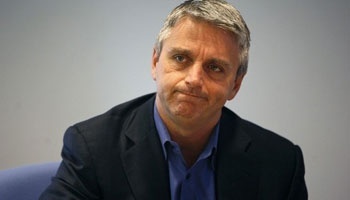 Electronic Arts chieftain John Riccitiello is fed up with poor software sales on the Wii, and thinks Nintendo isn't doing enough to support the family-friendly console. During yesterday's earnings call with investors - the same one in which it was revealed that EA would be axeing 1500 jobs and doing the same for over a dozen unannounced projects - Electronic Arts CEO John Riccitiello expressed frustration with how his company's software performs on the Nintendo Wii. The problem is exacerbated because Riccitiello believes EA produces the best third-party software for the platform: "To be honest with you, I think the Wii platform has been a little weaker than we had certainly anticipated. And there is no lack of frustration to be doing that at precisely the time where we have the strongest third-party share," he told investors. Nintendo hasn't been doing enough to spur interest in the console, he said, and could stand to release more first-party titles in order to renew consumers' interest in the Wii as a platform for things other than Wii Fit and Wii Sports: "Frankly, I think they need more beats in the year than they get out of a first-party slate - to be able to have the Wii software platform perform as well as they would like. We are building the products that I think [are] the most highly rated on the platform and at this point in time, generating the most revenue of any third-party platform." Nor is Nintendo doing its part to push third-party games as much as it ought to be, argued a frustrated Riccitiello, which is an incentive for the major third-party publishers to simply go elsewhere, "because very, very few multiplatform titles are succeeding on the Wii." It's not hard to see where he's coming from, and I can't imagine that Nintendo wouldn't benefit from helping third-party developers push their content when sales are drying up, but I'm not convinced that the solution is to simply ask Nintendo to release more Zelda and Mario games. Those big-name titles might drive people to play their Wii, but they'd probably just end up playing the first-party Nintendo titles and not anything from EA.